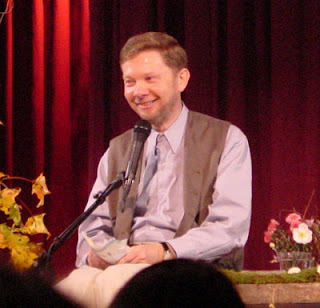 Eckhart Tolle is a very funny guy who has written some extremely helpful and inspiring books, such as ‘The Power Of Now’ and ‘A New Earth’. I had the very good fortune to be asked to interview him a couple of years ago and I thought I might share the wit and wisdom here! Given the kind of world that we live in, one has two choices, I feel. One can accept that we are all doomed and the planet is doomed and that things will just keep getting worse. Or one can actively seek out ideas and opportunities to make a difference, and take action on them. Personally, I am in favour of trying out ideas, in case one of them works, which is why I was extremely keen to read Eckhart’s book and also to speak to him in person. I had already read ‘The Power Of Now’, which talks about how most of us live our lives in thoughts of the future and of the past, and completely miss our actual lives which are happening right now in the present moment, which is the only moment that we ever have. While I completely and utterly agree with this, and while I do my best to meditate regularly, I immediately confess to him, when we speak on the phone (he lives in Canada) that I have been having trouble keeping my attention in the present moment, especially when I am about to interview someone, because of course I think ahead to what I am going to say to them and I worry that I will make a mess of the interview and it will be rubbish. ‘You may have been terrified before we spoke but now that we are speaking, you are not terrified, are you?’ he says. He has a very soft German accent, and rather a jovial tone, which is not what I had expected of such a heavyweight philosopher. ‘And our conversation flows quite naturally, from one thing to the next, without your having to think ahead?’ he asks. I admit that yes, it does. He points out that this is the subtle difference between using your head to calculate what you will do in the future and allowing your consciousness, or intuition to guide you. ‘Clarity and wisdom come from being in a state of pure consciousness,’ he says. Which is why, when he comes to Ireland on the 19 of this month to give a talk, he will not be making any notes, nor will he rehearse a speech. ‘I just turn up, and allow the energy of consciousness to speak through me,’ he says. I suggest that this must be a lot easier and more relaxing than having to have a plan. He agrees. Eckhart is already extremely popular and rich and so he really doesn’t need to travel around the world, giving talks. But he feels that it is his life’s purpose to spread his message. His essential message is all about awareness of the human ego, he says, and about the ways in which it limits us and causes suffering, to ourselves and to the world in general. Part of the problem is that the ego is in constant need of boosting, because by it’s very nature it is fragile and feels small and insignificant, and deep down it senses that when we die, it will die too. So it tries its best to build itself up by creating a strong sense of identity. The more successful we are, the more superior we feel to others, the more status we accumulate, the stronger the ego becomes. Which explains our societies compulsive need to acquire more and more stuff, even at the expense of our relationships and at the expense of our planet’s resources, and our out of control appetite for all things celebrity related. As well as our obsession with being impossibly thin and beautiful and looking young and fit no matter how old we actually are. All of the obsessions of the ego keep us in a permanent state of anxiety, of worrying about how we will get more of what we want and how we will hang on to what we have. Sometimes the anxiety can lead to mental and emotional breakdowns. When he was in his twenties, like most people Eckhart strove to be special and important. ‘But I didn’t have good looks or a stunning physique to impress people with,’ he laughs. ‘So I had to become an incredibly successful academic.’ Needless to say, the success did not make him happy, and he became depressed and suicidal. And one night, when he was twenty nine, everything changed. He has stayed in that state ever since, which is why, he says, he goes around the world teaching other people how he did it. I tell him that I have been meditating for fifteen years, hoping to reach that state. He laughs. He is optimistic that as people become aware of how their ego is creating the suffering that they experience, the awareness in itself will help them not to identify with the ego, but instead to identify with the part of us that is loving and connected and secure and eternal. It is this state of awakened consciousness of what is real and what is not real that will change our world, he says. ‘A new heaven and a new earth are arising in you at this moment,’ he says in the book. And I have a feeling he could be right, even if it is taking its time.